With that said, vim has a steep learning curve that often does not feel worth it if you are used to Command+c to copy, Command+v to paste and you like thinking while moving your mouse. If vim has done one thing, its made me very cognizant of what I am trying to achieve. The emphasis on achieving as much in as little time, and the freeing of mental overhead from reaching all over the place, allows me to approach programming much more mindfully. But as of today, “How to exit the Vim editor?” has 2644 votes on Stack Overflow!!! Notice that we never touch the mouse! We never reach for the arrow keys. In fact with the right shortcuts, you never take your fingers off the home keys. It’s really hard to state how much this frees your mind. Until Elon Musk’s Neurolink allows as to change modes AND input text by brain implants, vim will be how to change text. vim settings are important for every vim user and you shouldn’t have to use a vanilla vim setup just because you ssh into a VM or set up a new computer. Since most vim settings have zero personal data, the most convenient thing to do is to upload your vim directory+settings onto the internet for the world to bask in your glory and for you to pull down to any computer. vim will source the file ~/.vimrc and since our real config is located in our .vim directory, we will need to create a symlink that links our ~/.vim/.vimrc to ~/.vimrc. Once you run the line above, you will have a symlink in your root directory that points to your ~/.vim/.vimrc and any file changes you make to either will “update” on both. 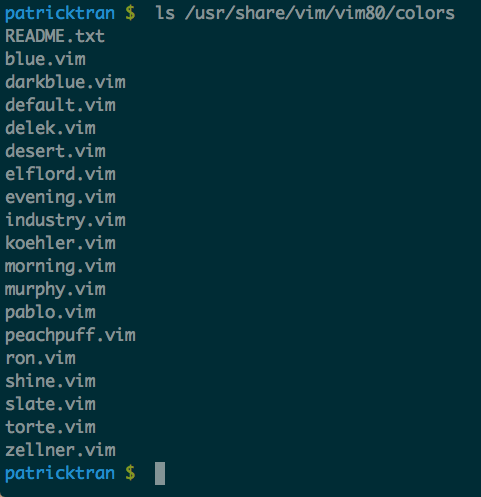 Initialize your .vim directory, add the remote branch and push your first commit.